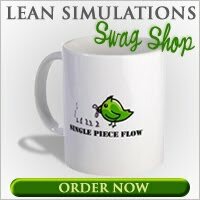 Lean Simulations: GE Lean Video? General Electric Motivates You! GE Lean Video? General Electric Motivates You! Here's a little motivational lean video from GE. Yes, the same General Electric that outsourced most of their manufacturing to low wage countries. The guys at Evolving Excellence have been following GE's lean and non-lean escapades for quite some time. Just last week, Kevin Meyer posted again about General Electric "reshoring" appliance manufacturing back to North America. It seems GE may have learned it's lesson and come back to where the customer's are. Or perhaps it's a billion dollars spent on public relations? In any case, the video, which was fittingly released just after the above article, does say some positive things about lean. In fact it really pumps you up! General Electric is a massive company and naturally, they have a massive marketing budget. . . with money to spend on professional quality video. Whether you believe that GE is on the forefront of lean (as they claim) or late to the party, they sure know how to make it sound good! Lean manufacturing is a holistic approach to making things, from concept to completion. Lean manufacturing makes us more competitive than ever before. Looking at the video, you can see some signs of lean. Flow racks, single piece flow, simple tools and fixturing, visual flow charting. Hopefully, they'll see some value in their investment and continue to push lean throughout the whole GE organization. I dare you to watch this video without getting excited about lean manufacturing!